1. The radiation is reduced by 90%. 2. No environmental damages from developing and fixing solutions. 3. The x-rays maintain their quality forever. 4. Can be transmitted to any distance momentarily. 6. Can be enlarged for better reviewing. 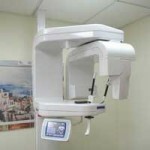 Panoramic x-ray on site – 90% less radiation. Bite wings – show caries and restoration defects between the teeth. 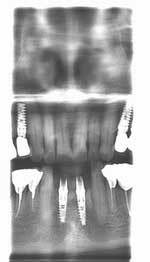 PA – Periapical Digital x-ray – shows individual teeth. 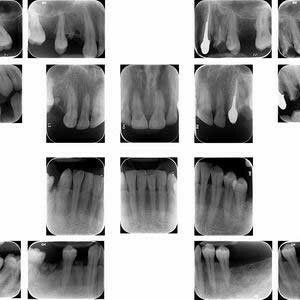 Periapical status – a series of 14 periapical x-rays, showing each tooth separately. 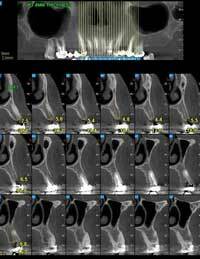 Panoramic x-ray on site – 90% less radiation – shows the situation in general. 3D analysis of the jaw and the teeth . 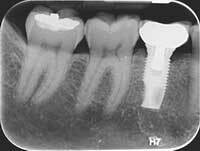 A must in dental implant therapy.